AKP Austria representative Mahmut Koç. In a video shared online the representative of the ruling Justice and Development Party (AKP) in Austria Mahmut Koç says if the transition to an executive presidency in an April 16 referendum is not realized, Turkey will face civil war. Speaking to an audience in Austria in favor of the executive presidency, Koç says in the video, “If a bad result comes out of this referendum, God forbid, a civil war will break out,” in an attempt to convince people to work for the “yes” campaign. Main opposition Republican People’s Party deputy Tuncay Özkan shared the video bearing Kurdish news agency ANF’s logo on Saturday on social media. Earlier during the week, AKP Manisa provincial deputy chairman Ozan Erdem, who warned of a civil war if a “no” vote emerges from the referendum, resigned from his post. Erdem came to public attention with his controversial remarks during an AKP youth wing meeting in Manisa’s Soma district on Monday, suggesting that party members must be ready for a civil war if the referendum on the constitutional amendment package that will switch Turkey to an executive presidency fails to be approved. Antalya Deputy Public Prosecutor Cevdet Kayafoğlu. Meanwhile, Antalya Deputy Public Prosecutor Cevdet Kayafoğlu tweeted on Friday that those who vote “no” in an upcoming referendum for a constitutional amendment package which will switch Turkey to an executive presidency will be treated as members of the outlawed Kurdistan Workers’ Party (PKK). 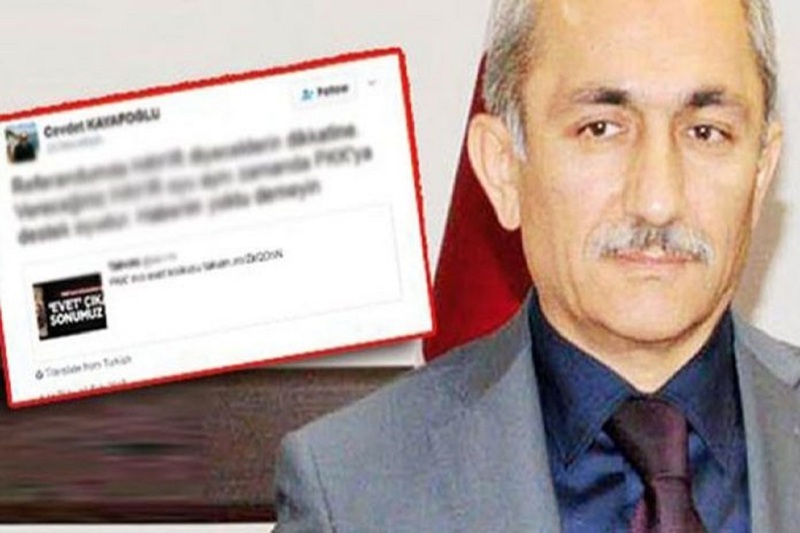 Hürriyet said Kayafoğlu could not be reached to comment on his tweets and that his secretary said he doesn’t want to comment on the issue. Following reactions to his remarks on Twitter, Kayafoğlu first deleted his profile photo, then his title and then the post from his account. On Feb. 6, Turkish Prime Minister Binali Yıldırım said a campaign calling on citizens to vote “no” in the upcoming referendum on constitutional amendments that will expand President Recep Tayyip Erdoğan’s power and lead to a switch from a parliamentary to a presidential system of governance is being orchestrated by the PKK and the faith-based Gülen movement. “FETÖ,” or Fetullahist Terrorist Organization, is a derogatory term coined by President Erdoğan and the Justice and Development Party (AKP) to refer to the Gülen movement, a global civil society movement inspired by the views of US-based Turkish Islamic scholar Fethullah Gülen.